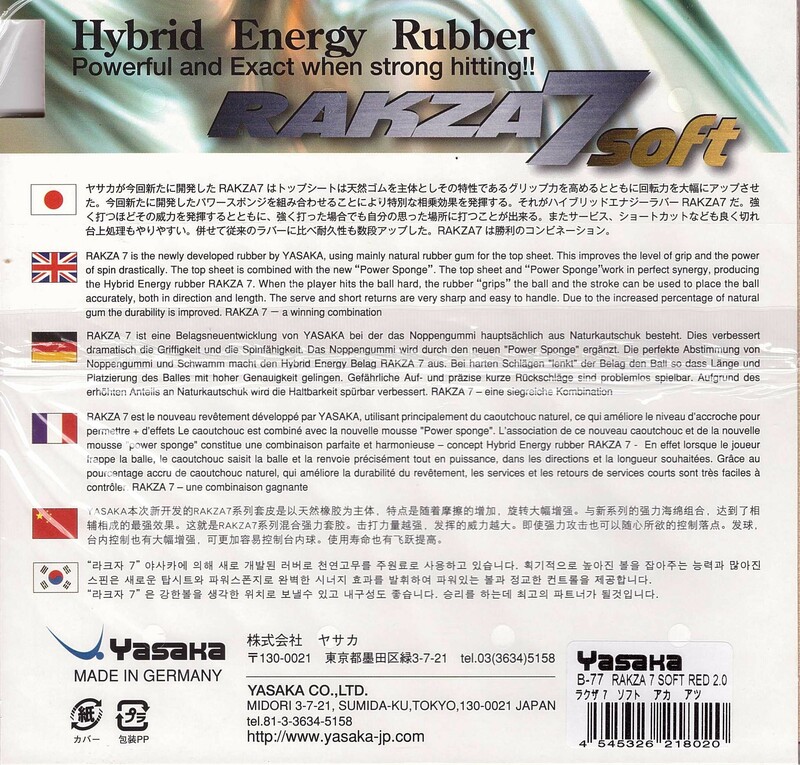 Yasaka has produced the Rakza series, a rubber line built for a strong spin and offensive play style. 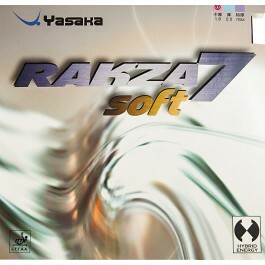 Rakza 7 Soft incorporates the same topsheet used in the original Rakza 7 but with a softer sponge. While similar in style and ability to generate spin, the softer sponge allows for a noticeable increase in control with minimal loss of speed. Select 4 products from our Buy 4 Pay 3 category and add them to your cart. The cheapest of these 4 products will get a 100% discount. Muy buena goma , rápida y de muy buen giro. Y el 4x3 es mucho major. Good rubber for a reasonable price. Topsheet is very grippy. Made in Germany. Little bit too soft for me. I'm a cpen player, I've used it on my BH. I found it's a little heavy and a little too soft for me. It's good for attack with RPB close to table and I use it for setting up attacks. It's not suitable for RPB blocking, especially from mid-far table distance. Perfeita para quem quer um pouco menos de velocidade, sem perder a potência no ataque. Muito bom controle. Great rubber, bouncier and softer than R7. I use it on my BH and feels greats. Has good balance of spin and speed. Recommended. Estou com uma semana treinando com essa excelente borracha, desejada de todos que praticam o TM, e me sinto tranquilo no controle e ataque. Pois, até agora, realmente, nada tenho a reclamar dessa aquisição feita na T11. Parabéns! Nice and decent rubber with good control, for backhand. Soft rubber with good control and easy to use. Spin is as per technique. On backhand it's a beast. On forehand it's also incredible. I bought a bunch for the kids I help train and friends. Everyone says it's the best rubber they've ever used. I've gone through four or five of these rubbers in the last five years. I'm an old guy, more defense than offense, but this rubber gives me the occasional clear winner and often creates a difficult to return high-looping shot to my opponent's backhand. Excellent rubber for FH, Xiom Zetro Quad and Donic Acuda P2 on BH. For me, this is very good. A very good ALL++ / ATCK rubber. Recommended! If you like very soft rubber, this is for you. Grippy surface and soft sponge ~ 40 ESN Scale. Paired well with hard / fast carbon blade of ALC/ZLC things. Хорошая накладка, ползуюсь 2 мм толщиной. Fast, spinny and reliable like Butterfly Tenergy 05. I really like the high throw angle. 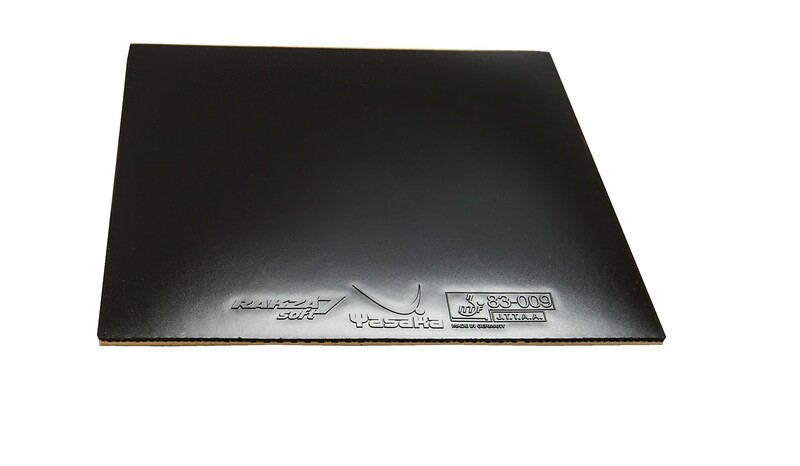 A huge upgrade from Yasaka Mark V which is also a well-known great rubber. Can't beat the price. My friend tried it and said it is as fast and spinny as Tenergy 05. 2.0 on Donic Li Ping Kitex. Great feeling of the ball. For me better than Rakza X.
Rakza X is faster. I was looking for control and spin, got what I wished for. Many thanks TT11. Супер вращение, достаточно контроля и скорости. It is a very good rubber. I guess it requires a certain preference e.g. looping. Great control, superb blocking qualities, excellent quality from Yasaka. Fast and spinny, recommended as a backhand rubber. I used it almost five years for fh 1.8mm on fast blade and I can say all the best for this rubber. Control, speed, spin close and away from table is great. I liked it. It’s very slow. For backhand. 27/07/2018 Awesome Rubber Review by David R.
I just starting using this rubber a couple of months ago and it is already my favorite forehand rubber. Ordered "Max" thickness. Very spiny, moderately fast, and good touch when returning serves. My loops drop-in like a bullet. Gives a sense that you cannot miss. I've let several people try my paddle, with this rubber, and each has ordered some for their own paddle. Much less expensive than Tenergy, with similar qualities. And at least for now it's in the "buy 4, pay 3" bin. Odlicna guma , brza , ali se brzo trosi. Overall, I love the performance of this rubber, however, after a month, some parts of the rubber edge starts chipping off. Recently I have bought Rakza 7 Soft 2.0 instead Donic Acuda S3 Max. Main idea was to make ball trajectory lower and increase speed on my backhand. These two goals were achieved and I pleased am with it. I use blade Peter Korbel Japan. A lot spin for looping. Love it. I have used this rubber for more than 3 years. One of the best rubbers I have ever used. Very unique. Services from Tabletennis11 is exceptionally good. I have been extremly happy in doing business with them. Soft and best for bh flick.This is my favorite BH ribber on fastblades now. excellent to block and attack, pleasant sensations, great spin, only excellent qualifications for this yasaka product. Best rubber for the price. Rakza 7 soft and regular are my favorite Japanese rubbers. Soft Max is probably the most like Tenergy in its ability to generate spin and speed. I recommend Rakza 7 Soft Max if you play away from the table because the thicker sponge will absorb lots of energy that will be released due to the trampoline effect. The softer sponge also helps when serving. One must close the paddle a little more and make flatter strokes to keep the ball down because the tangential for force is higher than most other rubbers even compared to regular Rakza 7 2mm which is what I use on my FH most of the time until now. lots of spin.I was able to defeat a higher ranked player with timo boll alc blade with tenergy 05 and fx with rakza 7 on FH and 7 soft on bh.the spin coming from 7 soft on chopping was enormous tenergy 05 couldnt handle this.I am happy with it. Несколько ребят юзают с удовольствием. Отличные перекруты, блоки со стола, грип - супер. I like this rubber on my backhand as i have low throw aim and want a high throw rubber for it and a little speed as this is a tensor rubber. This rubber (2.0) is too fast, and have a lot of spin, if you do not control it perfectly, It will be against you. Near the table, if the ball arrive slow with a lot of spin, is very difficult to control it. Bought this sheet for a friend and he says its good. I like this rubber a lot and use it as my backhand rubber. The most important thing to keep in my with this rubber (Rakza 7 soft) is that it has a high throw angle. I purposely bought it because I wanted the ball to bounce higher off my backhand. If you want a medium or low throw angle then do not buy this rubber. Overall it has a nice catapult effect for mid distance play. I'd say that the top sheet is medium tacky. It's not as precise for pushing and serving compared to a non-tensor rubber, but I guess there are always trade offs. I use the 2.0mm sponge with both an allround and an off- paddle. Very soft rubber, alll +. 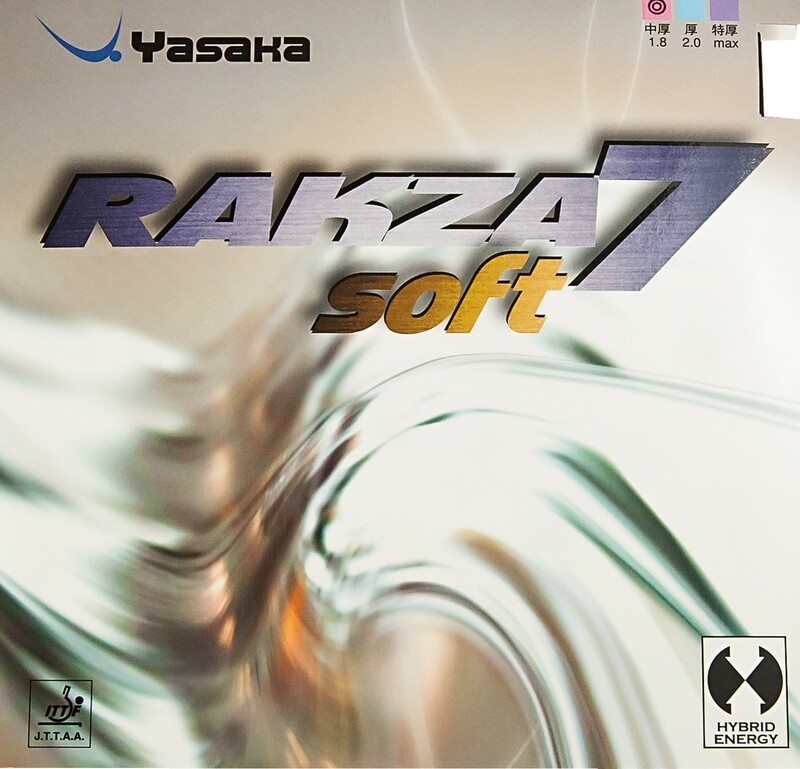 I did not fell a considerable difference between Rakza 7 and Rakza 7 soft. It is still a reliable rubber in the soft version, perhaps with a bit less catapult effect and an arc a little lower. It does everything well. TT11 service is always the best! nothing wrong with the balls though. I also noticed, that there is enough spin playing defence or soft topspin. It is one of the best backhand rubber on the market. It fits very well on offensive blades allwood and Alc. Good job tabletennis11 team. ocen xoroshaja nakladka na BH. I put this rubber on my backhand on a Viscaria. Everything is just decent, but not very outstanding. Spin is better than average. Throw is too high, and the ball can go off the table easily. I switched back to Tenergy for better speed. I bought this against the general principle of not using a soft rubber on BH. It lacks power. The control is ok.The arc of the ball on bh is very high making it an easy kill. Dissappointed. Infact it works better on fh. Will change this rubber pretty soon. Goma blanda, rapida por lo menos para el derecho me parece excelente para revez me queda muy rapida pero eso es problema del jugador, no tiene mucho spin pero es el necesario. I bought this rubber after reading its reviews and after using it realised that this is really the beast on my blade. Using it on BH and shots are very much spinier. Power is also good. I just a beginner to this game and i have started to become a fan for rakza. Very nice rubbers and pretty affordable. I put both the red and black rubbers on my new Hadraw VR blade and they worked very well together, providing good speed and spin. Yet to see how durable they are. Note: I was on a business trip out of the country while the survey email arrived. Just returned to the US and submitted the review. Thanks. I thought it was slower but actually is is faster than DHS H3 Neo. this rubber is light about 40grams agter cutting and is bouncing with a good spinideal for backhand that can give you a good block and fast return shot. but the rubber is too soft and curves easily after gluing which makes it difficult to handle and place on the blade. This product is the most popular rubber at our Club. It has excellent control and power when required. Good choice of ruberie for my BH. Good rubber, fast shipping. Recommended. Would buy again. As expected from the softer sponge, the Rakza 7 Soft is a less explosive but more forgiving version of the Rakza 7 while retaining it's capability for high amounts of spin. The downward arc on topspin shots is especially noticeable due to the lower speed and medium-high throw that it produces, allowing a high margin for error. Although it describes itself as a soft rubber I still find it fast enough on my FH. It goes extremely well with a hard blade (I use 1-ply Hinoki 10mm). The softness gives you excellent dwell time along with the grippy topsheet you can generate enormous amount of spin. I use 2mm thickness and it's more than enough for my FH. I'm a looper and this rubber can give you powerful loops. Dont be decieved this rubber is not soft. It has a medium hardness. First impressions when I played with it were quite an experience. This rubber is pretty fast and can generate efficient spin ,but lacks the ability to control incoming topspin shots. When serving it is a little difficult to get the ball short , this is because of the speed of the rubber and because I am using a fast blade. Other than that it is a good rubber. This is an excellent rubber. I used it for my back hand. Ise selle kummiga mänginud ei ole kuid, kes mängivad need kiidavad. Fxp ye göre çok daha kontrollü. Spini çok az düşük. found quite a marked difference between these soft vs rakza 7 std…good bat dwell, have improved slow forehand loops no end…a bit on the heavy side in max thickness,not an issue for us….superb ,fast service from the opposite side of the planet…. This is just about the most consistent rubber I have used. The soft sponge allows for a high dwell time. I recommend the max version of this product because it is not that heavy. Works really well for RPB too. Excellent rubber for my BH. A good rubber. Just a bit of the force, the speed of the ball tend to be faster. A good product for fast and aggressive player. I use 1.8 on the backhand for good control and spin. Tried it on the forehand and wow, nice kick off the table when hitting topspin drives. Liked it even better on the forehand. I'd have to say for an intermediate player, this rubber gives you great all around control and spin. If paired with a fast blade, you will also have plenty of speed. I've tried different rubber: rakza 9, revolution MX, blue fire jp3, renanos hold. So far this one is the best of all. It give a good control and spin. I received my orders in 4 days. Very good service and customer care from tabletennis11. Got this in 1.8 for the backhand. On other site this rubber is not rated as high for control but I disagree. My previous rubber was the Mark V rubber that I thought had great control already, but this rubber beats it by a land slide. I see where I want the ball to land and this rubber really helps put it there consistently. I've used Rakza 7 Soft 2.0 on my backhand on Korbel (and Primorac a little). Playing with old good celluloid ball. First of all it's a bit soft (and slow) for my liking. This is because my BH lacks power and you can get out a speed from R7S only if you have some power on your backhand. This is not my case. But anyway if you have a good stroke on your BH you will be granted with a good speed. Pushes and short game is very good with R7S. I believe on slower blade it can be used as an all-around rubber. The rubber being soft is a notch more forgiving than it's counterparts. Moderately sensitive to spin I'd say. The rubber is able to produce a very good spin. However I used it on my BH which is quite weak to tell about top spins ability. Overall I can say this is a very good rubber. If compared to Tenergy 05 FX which I use currently I'd say R7S is less sensitive to incoming spin, has less sped, less catapult and feels softer, spin I'd say also a bit less on R7S. Основание Butterfly BOLL FORTE OFF ВН:RAKZA 7soft max FH: RAKZA 9max. RAKZA 7 Soft max играю давно,с момента её появления. Она хорошо играет на чисто деревянных, так и на композитных основаниях. Отличное вращение. Очень комфортно играть серийными вращениями, производить скрутки со стола. Хорошо проявляет себя в плоских ударах. Hızlı oyuncular için kontrollü BH, Kontrollü oyuncular için ise güzel bir FH lastiği. Alternatifleri arasında en iyisi diyebilirim. Sünger kalınlığı ile hız ayarı yapabilirsiniz. Gerçekten iyi. Excellent rubber, great power and spin! very good for loop. It catches ball good and gives a very strong spin. And it is very durable that it lasts about 6 month. Pros - Spinner at a good speed.This is a soft and heavy rubber. So those who look for light weight assembly should consciously choose a light weight blade and also conscious of weight of the rubber on the other side. I have been using it for 5 months. During this time the rubber is keeping excellent speed, spin and control. Very reliable, long-life rubber. Excellent spin and speed for forehand, control Is also above the average. I love it!!! Many gears, lots of spin and very good control. Use max thickness on both FH and BH. My Buddy is now using it for forehand also. Great control, lots of spin and plenty fast. Great paring with hard blade. I bought it instead of tenergy 05fx 1.9 for BH. I can say that i didn't find any big difference between them while playing. It works good and costs less. I think it's good choice for BH, for FH it seems to be too soft. I started using this rubber and got on with it immediately. My forehand is weaker than my backhand so I needed something with good speed but excellent control. This is it! I am using on both FH and BH. It has very good spin, control and a decent power when requires. And must appreciate quality service from tabletennis11. Взял уже второй раз по акции, правда не себе, а приятелю. Он в полном восторге. До этого он играл контрафактом из китая (очень кстати приличным), теперь у него топсы полетели по сумасшедшей траектории, брать просто не реально, тем более, что он левша. Отличная накладка! Высокая скорость, вращение и контроль ! Очень цепкая! Очень хорошая накладка! Правда, мне пришлось немного скорректировать привычную для меня технику , но вскоре, все встало на место. Рекомендую! Or feels more dead than Tenergy 05 FX. But much cheaper than T05. The Rakza 7 soft is a very good rubber, it's on par with Tenergy 05 in term of looping ability. Table Tennis 11 provide great service, quick delivery. I was using the Sriver on the Backhand and wanted something more lively and now using the Rakza 7 Soft 2.00, getting used to it slowly, defenitely more spinnier and fast than the Sriver. I use tenergy on the fore hand R7S is defenitely less Spinnier & less tackier than Tenergy. But i think it will last longer than the tenergy. I am thinking of going with R7S Max on the fore hand aswell as soon as I am done with the Tenergy. I like the price and firmness of the R7S topsheet so i think it will last longer. good control and speed works well on my carbon blade. Buckets of spin and speed, I've put it on an ALL blade as I think faster would have been trickier for me at my level. have changed from a Yasaka V max on a OFF balsa blade.. even my first 4 sessions have allowed me to compete at a higher level. I thought I'd need more time to adapt, but this rubber really rewards a brave topspin attacking game. I normally use Xiom Omega IV Elite as my backhand rubber, but decided to try this as Table Tennis 11 recommended it and the recent special offer. The sponge is medium soft, not quite as soft as the Xiom, but still fairly soft. The top sheet however is much less supple. This is taking a bit of getting used to; currently I actually prefer it on my forehand. The top sheet is very slightly tacky at first, but this soon wears off and although it does not feel as grippy as some, generates plenty of spin. It is fairly fast, considering how soft the sponge is. The rubber looks as though it will last a really long time. Хорошая накладка! Брал по акции со скидкой! Супер цена и качество! This is one of the best backhand rubbers I ever tried. I love the spin and control. Good Price too! On one Stiga Classic Offensive (BH), my block is improved and produces spin easy. Speed is good. Have been using this rubber for BU for a long time and replaced Tenergy 05. My BU improved significantly for blocking and looping. The best BU rubber period. Price is great from TT-11 also. I have purchasd so many over the months I lost track. Best rubber for all types of players. Not bad at all. Good control, plus good friction. Paste and play. Long-lasting, quick, spin, excellent rubber. Thank you tabletennis11.com. This combo seems to work for me. I noticed that my shots became more reliable. Great Rubber! Great spin and amazing control. I use them on a Thibar Stratus Power Wood (OFF-) both for bh and fh and my play immediatly improved: top spin, drive, push, block, serve come very easy and controlled. Quite hard to push the ball out of the table. I have read that this rubber is equal to the most expensive Butterfly Tenergy and I have to admit that it pretty similar. I like the soft feeling that it has. It's even better for me than the Tenergy 80 I had used before, since Tenergy hasn't released a Tenergy80 FX yet. Quality product, fast shipping, nice price. What more can you expect ? Rubber for me, very happy. Not very fast , a rubber for controlled game. Keep on the good professional work. After about one month with three 2-hour sessions per week, it still plays like new. I put on my innerforce BH and it is good for looping and blocking. Its control is very good. Very light weight too. I think it is very nice rubber but the problem is that you should consider it is very fast. the smashes are very exact and you can play top spins very well. But If you are not advance playe try not to buy maximum. because you can not cut the balls and you can not block the opponent's top spins. But I strongly recommend these rubber to my friends. Very good price for nice rubber. Decent speed, great spin, excellent control. It soft rubbers are your thing, try this. With TT11's sale price, there is nothing out there to equal it for less than double the money. Spin is excellent. Not tacky. Sheets are lasting about 3 months playing 20+ hrs per week. I have to play with 1.8 mm because thicker gets too fast to chop with, but with 1.8 mm its still fast enough for me to attack or smash with, and my chops have tremendous spin if I get under it well. It has taken 6 months to really get used to it, but I think it was worth the effort. Really excellent rubber with fantastic control and power for an Offensive player(at last, It´s a tensor). Better for BH due to it´s control and softness. My main BH rubber paired with Xiom Omega V FH in my Butterfly Innerforce ZLC. this is one of the best rubbers for backhand. perfect control, fast but not very fast and very good spin.. just started playing with it but fell in love with it. again excellent delivery by tabletennis11. This rubber is very good in speed and spin, and the top sheet as well as the sponge are both medium soft. The weight of the rubber is average - light, which makes a great option for penholders that are very particular about rubber weight. La uso desde hace 1 mes. Esta goma es realmente muy buena para el revés. Blanda pero no tanto como la Acuda S3. Tiene un bloqueo mas consistente y un ángulo de rebote mas corto. La recomiendo! Super spin and very good control with acceptable speed. Apres plusieurs années d' arret et une saison de recherche du meilleur revetement, j' ai découvert celui-ci et c' est fantastique. Very strange not usual rubber that required some time to get used to it. The sponge is the softest sponge i have played with and the ball bounces like hell. The rubber provides superb spin and very good control with acceptable speed. Very good clicking and the sound is like stretching sling shot's rubber with catapulted ball feeling. Definitely not for beginners. My intention was to use this rubber on FH and on BH Friendship Super Soft and i used them opposite now as this rubber provides better play on BH. The perfect rubber....for 4 years i was using tenergy 64 & 25 in forhand and last month i decided to change in to a softer rubber...i tried rakza 7 soft (2mm)... very nice feeling because of the soft sponge...Excellent top spin, very grippy, excellent block. the blade i use is TIMO BOLL ALC. good price and excellent quality. I recently bought a rubber, first impressions are excellent. I hope in the future to shop in Tabletennis11. I have lost count how many I have bought but this rubber is of top value , the best priced in the internet world. even though it says 'soft' , it has good feel and is quite fast. Again it depends on your strokes but I have it on my backhand and is considering putting one on my FH also. Goes really well with Yasaka Silver Allwood CP. Don't lose sight of the fact that tensors are soft, and this is a soft tensor. Spin and control are excellent, but you do lose some putaway power.... Take your pick, are you a power player or a consistency player? Much softer than regular r7. liked it very much. soft, light and fast enough. also durable rubber. The soft version on special is an excellent buy. I regret only bought one. The rubber has a very good feel but maintains the speed of the rakza. I have it on Xiom V1 Quad CP on BH. This is by far the best rubber I have had for a long time. I have used Xiom Sigma and Yasaka Pryde 40 in the past but may change to Rakza for future replacements. Perfect for my BH(2.0), very good in blocks, the spin is fantastic in loops!!! In my FH(Max) I feel it slow but I´m trying to put more balls in the table!!! I like the combination with my Yasaka Extra Special!! This is a medium soft rubber with very control, huge spin and good speed. Good for those who like to play more strategically. Soft sponge gives a nice sound too. I am playing ping pong for more than 50 years..I participate in international tournements..I played with many rubbers..Tibhar,Butterfly,Andro...But the best one is Yasaka RAKZA 7 soft..The control,the spin and the speed are a good combination..Wonderful Rubber..
My backhand loop against backspin has been getting better after I swiched rubber from Nittaku FastArc S1 to Rakza7 soft 2.0 rubber; I also has been using Rakza7 max on my FH on another paddle; I like both version. I bought this in Red 2mm for my FH on an Acoustic early days but I am pleased so far , you can really feel the ball , it's by no means a slow rubber but by the same token it's not super fast and you are able to have a lot of control. Very pleased, great spin and control. Great rubber for great prize. I am using Rakza7 soft on BH. It's light and last longer.Good spin, control and speed when needed. For over a year Rakza 7 soft was my default rubber, both FH and BH, and it performed beautifully. It would be particularly good for a blade you find to be a little too aggressive because of its soft sponge. It's great for serves, chops, pushes loops and smashes, the speed is good for mid to close, but does not possess the speed of the Rakza7 on hard shots. I like it in 2.0 or max, find the 1.8 a little underpowered. I have gradually begun playing more with the regular Rakza 7 as I increase the speed of my game. Paired w/ a Stiga Rosewood XO blade. Satisfied w/ its speed, spinning and control. Certainly will order more from TT11. Fast and good control, i´m using with my DHS PG8, good combination, perfect for offensive player.